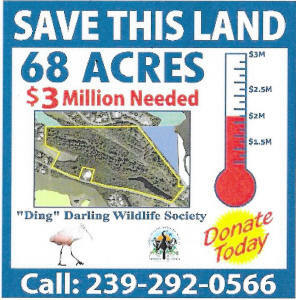 At its annual Go Wild for “Ding” fundraiser on February 13, the “Ding” Darling Wildlife Society-Friends of the Refuge (DDWS) announced its campaign to raise $9.5 million to purchase 68 acres of Sanibel property adjacent to the J.N. “Ding” Darling National Wildlife Refuge. “The ‘Ding’ Darling Wildlife Society has identified an exciting opportunity to further the land preservation legacy of ‘Ding’ Darling, but we need your help, and quickly,” a video presentation announced. The parcel, known as Wulfert Bayous, is currently permitted by the city of Sanibel for the owner to develop up to 29 large homes. DDWS has been working for several years behind the scenes to partner with funding sources and private donors toward the acquisition. As a result, on November 6, 2018, the Lee County Board of Commissioners voted in favor of exploring the acquisition and has asked county staff to pursue the possibility. DDWS also is looking into state funding and grants from the BP Horizon Spill as other alternative funding sources toward the remaining $6.5 million needed. “There’s a possibility that the $3 million goal may change, depending upon the amount of funding received from the other sources we are investigating,” said Birgie Miller, DDWS Executive Director. We need donations big and small to make our deadline. Click HERE to help save the last remaining 68 acres on Sanibel Island with a donation. Click HERE to help save the last remaining 68 acres on Sanibel Island with a pledge. 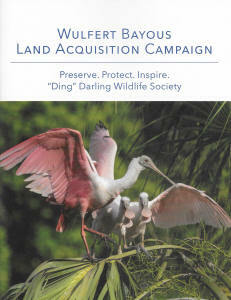 To make sure your donation goes to the Wulfert Bayous acquisition, please make a note of it in the Gift Comments box. Thank you for your support to keep the last piece of Sanibel protected as a wildlife corridor. Donate Today to Save Sanibel's Largest Remaining Parcel.